Our translation office with its headquarters in Trier offers translations in all languages and all areas, e.g. legal, economical, industrial, financial, technical, marketing and advertising, politics, IT, tourism, literature, art and culture, sciences, environment, education, social sciences and many more. We also certify already translated documents and certificates for approval by the relevant public authorities. 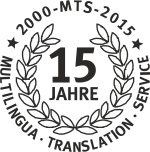 The MTS Multilingua Translation Service is one of the biggest providers of translation services in the Trier/Luxembourg area and vicinity. Since its establishment in 2000, MTS has been working intensively and successfully with numerous customers at home and overseas. These include companies, banks, lawyers, notaries, official authorities, courts, ministries, institutions, hospitals, educational authorities and private clients. Our work is based on specialist knowledge, reliability and discretion. Professional advice on all matters relating to your translation and our long-standing experience result in high-quality translations and first and foremost high customer satisfaction . All texts are translated exclusively by a qualified team of certified and state-approved translators with long years of experience. The result is consistent high quality. All translations can be delivered by e-mail or traditional hard copy worldwide. The choice is yours. Our interpreting services include consecutive, liaison and simultaneous interpreting as well as accompanying delegations at home and overseas. We look forward to assisting you in projecting your international image and improving customer confidence.